This article is about the Canadian region. For other uses, see Maritime (disambiguation). The Maritimes, also called the Maritime provinces (French: Provinces maritimes) or the Canadian Maritimes, is a region of Eastern Canada consisting of three provinces: New Brunswick, Nova Scotia, and Prince Edward Island (PEI). The Maritimes had a population of 1,813,606 in 2016. Together with Canada's easternmost province, Newfoundland and Labrador, the Maritime provinces make up the region of Atlantic Canada. Located along the Atlantic coast, various aquatic sub-basins are located in the Maritimes, such as the Gulf of Maine and Gulf of St. Lawrence. The region is located northeast of New England, southeast of Quebec's Gaspé Peninsula, and southwest of the island of Newfoundland. The notion of a Maritime Union has been proposed at various times in Canada's history; the first discussions in 1864 at the Charlottetown Conference contributed to Canadian Confederation which instead formed the larger Dominion of Canada. The Mi'kmaq, Maliseet and Passamaquoddy people are indigenous to the Maritimes, while Acadian and British settlements date to the 17th century. The word maritime is an adjective that simply means "of the sea", thus any land associated with the sea can be considered a maritime state or province (all provinces of Canada except Alberta and Saskatchewan border the sea). Nonetheless, the term "Maritimes" has historically been collectively applied to New Brunswick, Nova Scotia and Prince Edward Island, all of which border the Atlantic Ocean. In other provinces except Newfoundland & Labrador and British Columbia human settlement along the sea is sparse, since the Hudson Bay area is northerly and has a severe climate, with the majority of the populations of Ontario, Quebec and Manitoba residing far inland. The prehistory of the Canadian Maritimes begins after the northerly retreat of glaciers at the end of the Wisconsin glaciation over 10,000 years ago, human settlement by First Nations began in the Maritimes with Paleo-Indians during the Early Period, ending around 6,000 years ago. The Middle Period, starting 6,000 years ago, and ending 3,000 years ago, was dominated by rising sea levels from the melting glaciers in polar regions. This is also when what is called the Laurentian tradition started among Archaic Indians, existing First Nations peoples of the time. Evidence of Archaic Indian burial mounds and other ceremonial sites existing in the Saint John River valley has been uncovered. The Late Period extended from 3,000 years ago until first contact with European settlers and was dominated by the organization of First Nations peoples into the Algonquian-influenced Abenaki Nation which existed largely in present-day interior Vermont, New Hampshire, and Maine, and the Mi'kmaq Nation which inhabited all of Nova Scotia, Prince Edward Island, eastern New Brunswick and the southern Gaspé. The primarily agrarian Maliseet Nation settled throughout the Saint John River and Allagash River valleys of present-day New Brunswick and Maine. The Passamaquoddy Nation inhabited the northwestern coastal regions of the present-day Bay of Fundy. The Mi'kmaq Nation is also assumed to have crossed the present-day Cabot Strait at around this time to settle on the south coast of Newfoundland but were in a minority position compared to the Beothuk Nation. The Maritimes were the second area in Canada to be settled by Europeans, after Newfoundland. There is evidence that Viking explorers discovered and settled in the Vinland region around 1000 AD, which is when the L'Anse aux Meadows settlement in Newfoundland and Labrador has been dated, and it is possible that further exploration was made into the present-day Maritimes and northeastern United States. Both Giovanni Caboto (John Cabot) and Giovanni da Verrazzano are reported to have sailed in or near Maritime waters during their voyages of discovery for England and France respectively. Several Portuguese explorers/cartographers have also documented various parts of the Maritimes, namely Diogo Homem. However, it was French explorer Jacques Cartier who made the first detailed reconnaissance of the region for a European power, and in so doing, claimed the region for the King of France. Cartier was followed by nobleman Pierre Dugua, Sieur de Monts who was accompanied by explorer/cartographer Samuel de Champlain in a 1604 expedition where they established the second permanent European settlement in what is now the United States and Canada, following Spain's settlement at St. Augustine. Champlain's settlement at Saint Croix Island, later moved to Port-Royal, survived where the ill-fated English settlement at Roanoke did not, and pre-dated the more successful English settlement at Jamestown by three years. Champlain went on to greater fame as the founder of New France's province of Canada which comprises much of the present-day lower St. Lawrence River valley in the province of Quebec. Champlain's success in the region, which came to be called Acadie, led to the fertile tidal marshes surrounding the southeastern and northeastern reaches of the Bay of Fundy being populated by French immigrants who called themselves Acadien. Acadians eventually built small settlements throughout what is today mainland Nova Scotia and New Brunswick, as well as Île-Saint-Jean (Prince Edward Island), Île-Royale (Cape Breton Island), and other shorelines of the Gulf of St. Lawrence in present-day Newfoundland and Labrador, and Quebec. 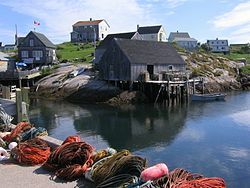 Acadian settlements had primarily agrarian economies, although there were many early examples of Acadian fishing settlements in southwestern Nova Scotia and in Île-Royale, as well as along the south and west coasts of Newfoundland, the Gaspé Peninsula, and the present-day Côte-Nord region of Quebec. Most Acadian fishing activities were overshadowed by the comparatively enormous seasonal European fishing fleets based out of Newfoundland which took advantage of proximity to the Grand Banks. The growing English colonies along the American seaboard to the south and various European wars between England and France during the 17th and 18th centuries brought Acadia to the centre of world-scale geopolitical forces. In 1613, Virginian raiders captured Port-Royal, and in 1621 Acadia was ceded to Scotland's Sir William Alexander who renamed it Nova Scotia. By 1632, Acadia was returned from Scotland to France under the Treaty of Saint-Germain-en-Laye, and the Port Royale settlement was moved to the site of nearby present-day Annapolis Royal. More French settlers, primarily from the Vienne, Normandie, and Brittany regions of France, continued to populate the colony of Acadia during the latter part of the 17th and early part of the 18th centuries. Important settlements also began in the Beaubassin region of the present-day Isthmus of Chignecto, and in the Saint John River valley, and settlers began to establish communities on Île-Saint-Jean and Île-Royale as well. In 1654, New England raiders attacked Acadian settlements on the Annapolis Basin, starting a period of uncertainty for Acadians throughout the English constitutional crises under Oliver Cromwell, and only being properly resolved under the Treaty of Breda in 1667 when France's claim to the region was reaffirmed. Colonial administration by France throughout the history of Acadia was contemptuous at best. France's priorities were in settling and strengthening its claim on New France and the exploration and settlement of interior North America and the Mississippi River valley. Over 74 years (1689–1763) there were six colonial wars, which involved continuous warfare between New England and Acadia (see the French and Indian Wars as well as Father Rale's War and Father Le Loutre's War). Throughout these wars, New England was allied with the Iroquois Confederacy and Acadia was allied with the Wabanaki Confederacy. In the first war, King William's War (the North American theater of the Nine Years' War), natives from the Maritime region participated in numerous attacks with the French on the Acadia/ New England border in southern Maine (e.g., Raid on Salmon Falls). New England retaliatory raids on Acadia, such as the Raid on Chignecto (1696), were conducted by Benjamin Church. In the second war, Queen Anne's War (the North American theater of the War of the Spanish Succession), the British conducted the Conquest of Acadia, while the region remained primarily in control of Maliseet militia, Acadia militia and Mi'kmaq militia. In 1719, to further protect strategic interests in the Gulf of St. Lawrence and St. Lawrence River, France began the 20-year construction of a large fortress at Louisbourg on Île-Royale. Massachusetts was increasingly concerned over reports of the capabilities of this fortress, and of privateers staging out of its harbour to raid New England fishermen on the Grand Banks. In the fourth war, King George's War (the European theater of the War of the Austrian Succession), the British engaged successfully in the Siege of Louisbourg (1745). The British returned control of Île-Royale to France with the fortress virtually intact three years later under the Treaty of Aix-la-Chapelle and the French reestablished their forces there. In 1749, to counter the rising threat of Louisbourg, Halifax was founded and the Royal Navy established a major naval base and citadel. 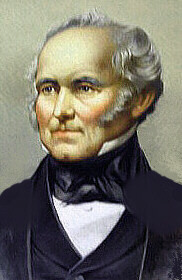 The founding of Halifax sparked Father Le Loutre's War. During the sixth and final colonial war, the French and Indian War (the North American theater of the Seven Years' War), the military conflicts in Nova Scotia continued. The British Conquest of Acadia happened in 1710. Over the next forty-five years the Acadians refused to sign an unconditional oath of allegiance to Britain. During this time period Acadians participated in various militia operations against the British and maintained vital supply lines to the French Fortress of Louisbourg and Fort Beausejour. The British sought to neutralize any military threat Acadians posed and to interrupt the vital supply lines Acadians provided to Louisbourg by deporting Acadians from Acadia. The British began the Expulsion of the Acadians with the Bay of Fundy Campaign (1755). Over the next nine years over 12,000 Acadians of 15,000 were removed from Nova Scotia. In 1758, the fortress of Louisbourg was laid siege for a second time within 15 years, this time by more than 27,000 British soldiers and sailors with over 150 warships. After the French surrender, Louisbourg was thoroughly destroyed by British engineers to ensure it would never be reclaimed. With the fall of Louisbourg, French and Mi'kmaq resistance in the region crumbled. British forces seized remaining French control over Acadia in the coming months, with Île-Saint-Jean falling in 1759 to British forces on their way to Quebec City for the Siege of Quebec and ensuing Battle of the Plains of Abraham. The war ended and Britain had gained control over the entire Maritime region and the Indigenous people signed the Halifax Treaties. Following the Seven Years' War, empty Acadian lands were settled first by 8,000 New England Planters and then by immigrants brought from Yorkshire. Île-Royale was renamed Cape Breton Island and incorporated into the Colony of Nova Scotia. Some of the Acadians who had been deported came back but went to New Brunswick. The most significant impact from this war was the settling of large numbers of Loyalist refugees in the region (34,000 to the 17,000 settlers already there), especially in Shelburne and Parrtown (Saint John). Following the Treaty of Paris in 1783, Loyalist settlers in what would become New Brunswick persuaded British administrators to split the Colony of Nova Scotia to create the new colony of New Brunswick in 1784. At the same time, another part of the Colony of Nova Scotia, Cape Breton Island, was split off to become the Colony of Cape Breton Island. The Colony of St. John's Island was renamed to Prince Edward Island on November 29, 1798. The War of 1812 had some effect on the shipping industry in the Maritime colonies of New Brunswick, Nova Scotia, Prince Edward Island, and Cape Breton Island; however, the significant Royal Navy presence in Halifax and other ports in the region prevented any serious attempts by American raiders. Maritime and American privateers targeted unprotected shipping of both the United States and Britain respectively, further reducing trade. New Brunswick's section of the Canada–US border did not have any significant action during this conflict, although British forces did occupy a portion of coastal Maine at one point. The most significant incident from this war which occurred in the Maritimes was the British capture and detention of the American frigate USS Chesapeake in Halifax. British settlement of the Maritimes, as the colonies of Nova Scotia, New Brunswick and Prince Edward Island came to be known, accelerated throughout the late 18th century and into the 19th century with significant immigration to the region as a result of Scottish migrants displaced by the Highland Clearances and Irish escaping the Great Irish Famine (1845–1849). As a result, significant portions of the three provinces are influenced by Celtic heritages, with Scottish Gaelic (and to a lesser degree, Irish Gaelic) having been widely spoken, particularly in Cape Breton, although it is less prevalent today. During the American Civil War, a significant number of Maritimers volunteered to fight for the armies of the Union, while a small handful joined the Confederate Army. However, the majority of the conflict's impact was felt in the shipping industry. Maritime shipping boomed during the war due to large-scale Northern imports of war supplies which were often carried by Maritime ships as Union ships were vulnerable to Confederate naval raiders. Diplomatic tensions between Britain and the Unionist North had deteriorated after some interests in Britain expressed support for the secessionist Confederate South. The Union navy, although much smaller than the British Royal Navy and no threat to the Maritimes, did posture off Maritime coasts at times chasing Confederate naval ships which sought repairs and reprovisioning in Maritime ports, especially Halifax. The immense size of the Union army (the largest on the planet toward the end of the Civil War), however, was viewed with increasing concern by Maritimers throughout the early 1860s. Another concern was the rising threat of Fenian raids on border communities in New Brunswick by those seeking to end British rule of Ireland. This combination of events, coupled with an ongoing decline in British military and economic support to the region as the Home Office favoured newer colonial endeavours in Africa and elsewhere, led to a call among Maritime politicians for a conference on Maritime Union, to be held in early September 1864 in Charlottetown – chosen in part because of Prince Edward Island's reluctance to give up its jurisdictional sovereignty in favour of uniting with New Brunswick and Nova Scotia into a single colony. New Brunswick and Nova Scotia felt that if the union conference were held in Charlottetown, they might be able to convince Island politicians to support the proposal. 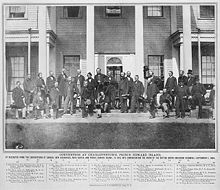 The Charlottetown Conference, as it came to be called, was also attended by a slew of visiting delegates from the neighbouring colony of Canada, who had largely arrived at their own invitation with their own agenda. This agenda saw the conference dominated by discussions of creating an even larger union of the entire territory of British North America into a united colony. The Charlottetown Conference ended with an agreement to meet the following month in Quebec City, where more formal discussions ensued, culminating with meetings in London and the signing of the British North America Act. Of the Maritime provinces, only Nova Scotia and New Brunswick were initially party to the BNA Act, Prince Edward Island's reluctance, combined with a booming agricultural and fishing export economy having led to that colony opting not to sign on. The major communities of the region include Halifax and Cape Breton in Nova Scotia, Saint John, Fredericton and Moncton in New Brunswick, and Charlottetown in Prince Edward Island. In spite of its name, The Maritimes has a humid continental climate of the warm-summer subtype. Especially in coastal Nova Scotia, differences between summers and winters are pretty narrow compared with most of Canada. The inland climate of New Brunswick is in stark contrast during winter, resembling more continental areas. Summers are somewhat tempered by the marine influence throughout the provinces, but due to the southerly parallels still remain similar to more continental areas further west. Yarmouth in Nova Scotia has significant marine influence to have a borderline oceanic microclimate, but winter nights are still cold even in all coastal areas. The northernmost areas of New Brunswick are only just above subarctic with very cold continental winters. Map showing the mother tongue of people in the Maritimes. Red represents areas with a majority of Anglophones and less than 33% Francophones, Orange, a majority of Anglophones and more than 33% Francophones. Blue shows a Francophone majority with less than 33% Anglophones and green a Francophone majority with more than 33% Anglophones. While Maritimers are predominantly of west European heritage (Scottish, Irish, English, and Acadian), immigration to Industrial Cape Breton during the heyday of coal mining and steel manufacturing brought people from eastern Europe as well as from Newfoundland. The Maritimes also have a black population who are mostly descendants of African American loyalists or refugees from the War of 1812, largely concentrated in Nova Scotia but also in various communities throughout southern New Brunswick, Cape Breton (where the black population is largely of West Indian descent), and Prince Edward Island. The Mi'kmaq Nation's reserves throughout Nova Scotia, Prince Edward Island and eastern New Brunswick dominate aboriginal culture in the region, compared to the much smaller population of the Maliseet Nation in western New Brunswick. New Brunswick, in general, differs from the other two Maritime Provinces in that its French population plays a significant role in the everyday cultural experience. Being the only officially bilingual province in Canada, many of New Brunswick's inhabitants speak both French and English, especially in Moncton and the capital region of Fredericton. Cultural activities are fairly diverse throughout the region, with the music, dance, theatre, and literary art forms tending to follow the particular cultural heritage of specific locales. Notable Nova Scotian folklorist and cultural historian Helen Creighton spent the majority of her lifetime recording the various Celtic musical and folk traditions of rural Nova Scotia during the mid-20th century, prior to this knowledge being wiped out by mass media assimilation with the rest of North America. A fragment of Gaelic culture remains in Nova Scotia, specifically on Cape Breton Island. PEI and New Brunswick share this historical tie to Gaelic culture with Nova Scotia but it plays a far less significant role in their respective public provincial images. Canada has witnessed a "Celtic revival" in which many Maritime musicians and songs have risen to prominence in recent decades. Some companies, particularly breweries such as Alexander Keith's and Moosehead have played up a connection between folklore with alcohol consumption during their marketing campaigns. The Maritimes were among the strongest supporters of prohibition (Prince Edward Island lasting until 1949), and some predominantly rural communities maintain "dry" status, banning the retail sale of alcohol as a vestige of the original temperance movement in the region. Given the small population of the region (compared with the Central Canadian provinces or the New England states), the regional economy is a net exporter of natural resources, manufactured goods, and services. The regional economy has long been tied to natural resources such as fishing, logging, farming, and mining activities. Significant industrialization in the second half of the 19th century brought steel to Trenton, Nova Scotia, and subsequent creation of a widespread industrial base to take advantage of the region's large underground coal deposits. After Confederation, however, this industrial base withered with technological change, and trading links to Europe and the U.S. were reduced in favour of those with Ontario and Quebec. In recent years, however, the Maritime regional economy has begun increased contributions from manufacturing again and the steady transition to a service economy. Important manufacturing centres in the region include Pictou County, Truro, the Annapolis Valley and the South Shore, and the Strait of Canso area in Nova Scotia, as well as Summerside in Prince Edward Island, and the Miramichi area, the North Shore and the upper Saint John River valley of New Brunswick. Another important contribution to Nova Scotia's provincial economy is through spin-offs and royalties relating to off-shore petroleum exploration and development. Mostly concentrated on the continental shelf of the province's Atlantic coast in the vicinity of Sable Island, exploration activities began in the 1960s and resulted in the first commercial production field for oil beginning in the 1980s. Natural gas was also discovered in the 1980s during exploration work, and this is being commercially recovered, beginning in the late 1990s. Initial optimism in Nova Scotia about the potential of off-shore resources appears to have diminished with the lack of new discoveries, although exploration work continues and is moving farther off-shore into waters on the continental margin. Regional transportation networks have also changed significantly in recent decades with port modernizations, with new freeway and ongoing arterial highway construction, the abandonment of various low-capacity railway branchlines (including the entire railway system of Prince Edward Island and southwestern Nova Scotia), and the construction of the Canso Causeway and the Confederation Bridge. There have been airport improvements at various centres providing improved connections to markets and destinations in the rest of North America and overseas. This has been particularly problematic with the growth of the welfare state in Canada since the 1950s, resulting in the need to draw upon equalization payments to provide nationally mandated social services. Since the 1990s the region has experienced an exceptionally tumultuous period in its regional economy with the collapse of large portions of the ground fishery throughout Atlantic Canada, the closing of coal mines and a steel mill on Cape Breton Island, and the closure of military bases in all three provinces. That being said, New Brunswick has one of the largest military bases in the British Commonwealth (CFB Gagetown), which plays a significant role in the cultural and economic spheres of Fredericton, the province's capital city. While the economic underperformance of the Maritime economy has been long lasting, it has not always been present. The mid-19th century, especially the 1850s and 1860s, has long been seen as a "Golden Age" in the Maritimes. Growth was strong, and the region had one of British North America's most extensive manufacturing sectors as well as a large international shipping industry. The question of why the Maritimes fell from being a centre of Canadian manufacturing to being an economic hinterland is thus a central one to the study of the region's pecuniary difficulties. The period in which the decline occurred had a great many potential culprits. In 1867 Nova Scotia and New Brunswick merged with the Canadas in Confederation, with Prince Edward Island joining them six years later in 1873. Canada was formed only a year after free trade with the United States (in the form of the Reciprocity Agreement) had ended. In the 1870s John A. Macdonald's National Policy was implemented, creating a system of protective tariffs around the new nation. Throughout the period there was also significant technological change both in the production and transportation of goods. Several scholars have explored the so-called "golden age" of the Maritimes in the years just before Confederation. In Nova Scotia, the population grew steadily from 277,000 in 1851 to 388,000 in 1871, mostly from natural increase since immigration was slight. The era has been called a golden age, but that was a myth created in the 1930s to lure tourists to a romantic era of tall ships and antiques. Recent historians using census data have shown that is a fallacy. In 1851–1871 there was an overall increase in per capita wealth holding. However most of the gains went to the urban elite class, especially businessmen and financiers living in Halifax. The wealth held by the top 10% rose considerably over the two decades, but there was little improvement in the wealth levels in rural areas, which comprised the great majority of the population. Likewise Gwyn reports that gentlemen, merchants, bankers, colliery owners, shipowners, shipbuilders, and master mariners flourished. However the great majority of families were headed by farmers, fishermen, craftsmen and laborers. Most of them—and many widows as well—lived in poverty. Out migration became an increasingly necessary option. Thus the era was indeed a golden age but only for a small but powerful and highly visible elite. The exact date that the Maritimes began to fall behind the rest of Canada is difficult to determine. Historian Kris Inwood places the date very early, at least in Nova Scotia, finding clear signs that the Maritimes "Golden Age" of the mid-19th century was over by 1870, before Confederation or the National Policy could have had any significant impact. Richard Caves places the date closer to 1885. T.W. Acheson takes a similar view and provides considerable evidence that the early 1880s were in fact a booming period in Nova Scotia and this growth was only undermined towards the end of that decade. David Alexander argues that any earlier declines were simply part of the global Long Depression, and that the Maritimes first fell behind the rest of Canada when the great boom period of the early 20th century had little effect on the region. E.R. Forbes, however, emphasizes that the precipitous decline did not occur until after the First World War during the 1920s when new railway policies were implemented. Forbes also contends that significant Canadian defence spending during the Second World War favoured powerful political interests in Central Canada such as C.D. Howe, when major Maritime shipyards and factories, as well as Canada's largest steel mill, located in Cape Breton Island, fared poorly. One of the most important changes, and one that almost certainly had an effect, was the revolution in transportation that occurred at this time. The Maritimes were connected to central Canada by the Intercolonial Railway in the 1870s, removing a longstanding barrier to trade. For the first time this placed the Maritime manufacturers in direct competition with those of Central Canada. Maritime trading patterns shifted considerably from mainly trading with New England, Britain, and the Caribbean, to being focused on commerce with the Canadian interior, enforced by the federal government's tariff policies. Coincident with the construction of railways in the region, the age of the wooden sailing ship began to come to an end, being replaced by larger and faster steel steam ships. The Maritimes had long been a centre for shipbuilding, and this industry was hurt by the change. The larger ships were also less likely to call on the smaller population centres such as Saint John and Halifax, preferring to travel to cities like New York and Montreal. Even the Cunard Line, founded by Maritime-born Samuel Cunard, stopped making more than a single ceremonial voyage to Halifax each year. Montreal and Toronto were well suited to benefit from the development of large-scale manufacturing and extensive railway systems in Quebec and Ontario, these being the goals of the Macdonald and Laurier governments. In the Maritimes the situation was very different. Today New Brunswick has several mid-sized centres in Saint John, Moncton, and Fredericton but no significant population centre. Nova Scotia has a growing metropolitan area surrounding Halifax, but a contracting population in industrial Cape Breton, and several smaller centres in Bridgewater, Kentville, Yarmouth, and Pictou County. Prince Edward Island's only significant population centres are in Charlottetown and Summerside. During the late 19th and early 20th centuries, just the opposite was the case with little to no population concentration in major industrial centres as the predominantly rural resource-dependent Maritime economy continued on the same path as it had since European settlement on the region's shores. Despite the region's absence of economic growth on the same scale as other parts of the nation, the Maritimes has changed markedly throughout the 20th century, partly as a result of global and national economic trends, and partly as a result of government intervention. Each sub-region within the Maritimes has developed over time to exploit different resources and expertise. Saint John became a centre of the timber trade and shipbuilding and is currently a centre for oil refining and some manufacturing. The northern New Brunswick communities of Edmundston, Campbellton, Dalhousie, Bathurst, and Miramichi are focused on the pulp and paper industry and some mining activity. Moncton was a centre for railways and has changed its focus to becoming a multi-modal transportation centre with associated manufacturing and retail interests. The Halifax metropolitan area has come to dominate peninsular Nova Scotia as a retail and service centre, but that province's industries were spread out from the coal and steel industries of industrial Cape Breton and Pictou counties, the mixed farming of the North Shore and Annapolis Valley, and the fishing industry was primarily focused on the South Shore and Eastern Shore. Prince Edward Island is largely dominated by farming, fishing, and tourism. The Maritimes are the only provinces in Canada which entered Confederation in the 19th century and have kept their original colonial boundaries. All three provinces have the smallest land base in the country and have been forced to make do with resources within. By comparison, the former colony of the United Province of Canada (divided into the District of Canada East, and the District of Canada West) and the western provinces were dozens of times larger and in some cases were expanded to take in territory formerly held in British Crown grants to companies such as the Hudson's Bay Company; in particular the November 19, 1869 sale of Rupert's Land to the Government of Canada under the Rupert's Land Act 1868 was facilitated in part by Maritime taxpayers. The economic riches of energy and natural resources held within this larger land base were only realized by other provinces during the 20th century. The maritime provinces' main industry is fishing. Fishing can be found in any maritime province. This includes fishing for lobster, mackerel, tuna, salmon and many more kinds of fish. Oysters and salmonid aquiculture is also increasingly important economically. Nova Scotia is very strong in agriculture, forestry and fishing. Tourism is important to the economy of PEI. Anne of Green Gables was written in PEI. Because of this, every year it attracts families to see where the beloved story was based, and in the summers, to enjoy beaches and sunlight. PEI is also known for its agriculture, mainly the potato, and fishing industries. Agriculture and forestry are two prominent industries found in New Brunswick. Despite having an extensive coastline, New Brunswick's industrial sector has never been entirely reliant on the success of the fisheries. Likewise, the strong shipbuilding heritage of the province directly relates to its forest resources. Because of this, New Brunswickers tend to attribute their cultural heritage less with the sea and more with their forests and rivers. In recent years, the social democratic New Democratic Party (NDP) has made significant inroads both federally and provincially in the region. The NDP has elected Members of Parliament (MPs) from New Brunswick, but most of the focus of the party at the federal and provincial levels is currently in the Halifax area of Nova Scotia. Industrial Cape Breton has historically been a region of labour activism, electing Co-operative Commonwealth Federation (and later NDP) MPs, and even produced many early members of the Communist Party of Canada in the pre-World War II era. 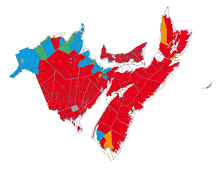 In the 2004 federal election, the NDP captured 28.45% of the vote in Nova Scotia, more than any other province. In the 2009 provincial election the NDP formed a majority government, the first in the region. The Maritimes are generally socially conservative but unlike Alberta, they also have fiscally socialist tendencies. It is because of the lack of support for fiscal conservatism that federal parties such as the Canadian Alliance never had much success in the region, In the 2004 federal election, the Conservatives had one of the worst showings in the region for a right-wing party, going back to Confederation, with the exception of the 1993 election. The Conservative party improved its seat count in the 2008 and elected 13 MPs in the 2011 election. However, in the 2015 election the Liberal Party won every seat in the region, defeating all of the Conservative (and NDP) challengers. An area within the region where both fiscal and social conservatism coincide and where the federal Reform Party and Canadian Alliance had some success is in central-western part of New Brunswick, in the Saint John River valley north of Saint John and south of Grand Falls. Contributing demographics include a predominantly Anglophone population residing in a largely rural agrarian setting. One influence might be proximity to the Canada–US border and the state of Maine. The valley is also settled by descendants of United Empire Loyalists whose influence continues in the area. There are also a large number of active and retired military personnel located in the Fredericton and Oromocto area as a result of the large military base at CFB Gagetown. Another area in the region with smatterings of coinciding fiscal and social conservatism is the Annapolis Valley of Nova Scotia. The Liberal Party of Canada has done well in the Maritimes in the past because of its interventionist policies. The Acadian Peninsula region of New Brunswick, long dependent upon seasonal employment in the Gulf of St. Lawrence fishery, tends to vote for the Liberals or NDP for this reason. In the 1997 federal election, Prime Minister Jean Chrétien's Liberals endured a bitter defeat to the PCs and NDP in many ridings as a result of unpopular cuts to unemployment benefits for seasonal workers, as well as closures of several Canadian Forces Bases, the refusal to honour a promise to rescind the Goods and Services Tax, cutbacks to provincial equalization payments, health care, post-secondary education and regional transportation infrastructure such as airports, fishing harbours, seaports, and railways. The Liberals held onto seats in Prince Edward Island and New Brunswick, while being shut out of Nova Scotia entirely, the second time in history (the only other time being the Diefenbaker sweep). In 2015 the Liberals won every seat in The Maritimes, defeating Conservative and NDP incumbents. The Maritimes is currently represented in the Canadian Parliament by 25 Members of the House of Commons (Nova Scotia – 11, New Brunswick – 10, Prince Edward Island – 4) and 24 Senators (Nova Scotia and New Brunswick – 10 each, Prince Edward Island – 4). This level of representation was established at the time of Confederation when the Maritimes had a much larger proportion of the national population. The comparatively large population growth of western and central Canada during the immigration boom of the 20th century has reduced the Maritimes' proportion of the national population to less than 10%, resulting in an over-representation in Parliament, with some federal ridings having fewer than 35,000 people, compared to central and western Canada where ridings typically contain 100,000–120,000 people. The Senate of Canada is structured along regional lines, giving an equal number of seats (24) to the Maritimes, Ontario, Quebec, and western Canada, in addition to the later entry of Newfoundland and Labrador, as well as the three territories. Enshrined in the Constitution, this model was developed to ensure that no area of the country is able to exert undue influence in the Senate. The Maritimes, with its much smaller proportion of the national population (compared to the time of Confederation) also have an over-representation in the Senate, particularly compared to the population growth of Ontario and the western provinces. This has led to calls to reform the Senate; however, such a move would entail constitutional changes. Another factor related to the number of Senate seats is that a constitutional amendment in the early 20th century mandated that no province can have fewer Members of Parliament than it has senators. This court decision resulted from a complaint by the Government of Prince Edward Island after that province's number of MPs was proposed to change from 4 to 3, accounting for its declining proportion of the national population at that time. When PEI entered Confederation in 1873, it was accorded 6 MPs and 4 Senators; however this was reduced to 4 MPs by the early 20th century. Senators being appointed for life at this time, these coveted seats rarely went unfilled for a long period of time anywhere in Canada. As a result, PEI's challenge was accepted by the federal government, and its level of federal representation was secured. In the aftermath of the 1989 budget, which saw a fillibuster by Liberal Senators in attempt to kill legislation creating the Goods and Services Tax, Prime Minister Brian Mulroney "stacked" the Senate by creating additional seats in several provinces across Canada, including New Brunswick; however, there was no attempt by these provinces to increase the number of MPs to reflect this change in Senate representation. • Patterson, Stephen E. (1994). "1744–1763: Colonial Wars and Aboriginal Peoples". In Phillip Buckner; John G. Reid (eds.). The Atlantic Region to Confederation: A History. University of Toronto Press. p. 144. doi:10.3138/j.ctt15jjfrm (inactive 2019-02-15). ISBN 978-1-4875-1676-5. JSTOR 10.3138/j.ctt15jjfrm. ^ Ronnie-Gilles LeBlanc (2005). Du Grand Dérangement à la Déportation: Nouvelles Perspectives Historiques, Moncton: Université de Moncton, 465 pages ISBN 1-897214-02-2 (book in French and English). The Acadians were scattered across the Atlantic, in the Thirteen Colonies, Louisiana, Quebec, Britain and France. (See Jean-François Mouhot (2009) Les Réfugiés acadiens en France (1758–1785): L'Impossible Réintégration?, Quebec, Septentrion, 456 p. ISBN 2-89448-513-1; Ernest Martin (1936) Les Exilés Acadiens en France et leur établissement dans le Poitou, Paris, Hachette, 1936). Very few eventually returned to Nova Scotia (See John Mack Faragher (2005). A Great and Noble Scheme: The Tragic Story of the Expulsion of the French Acadians from their American Homeland, New York: W.W. Norton, 562 pages ISBN 0-393-05135-8 online excerpt). ^ "National Climate Data and Information Archive". Environment Canada. Retrieved October 24, 2015. Wikimedia Commons has media related to Maritimes.